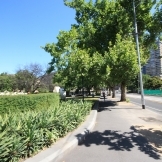 Burston Reserve is a small park located between Parliament Place and Macarthur Street at the eastern edge of the central city. 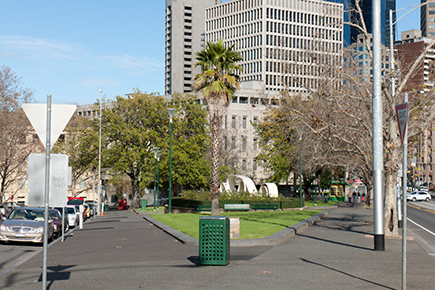 In 2012 the City of Melbourne released its Urban Forest Strategy. The strategy outlines the importance of the urban forest and green open spaces in cooling the city and adapting to climate change. At this time, several of the trees in Burston Reserve had either been removed or were in very poor health. The reserve was upgraded to increase its green footprint and open space and to become a water sensitive landscape. Expanding turf and garden areas and reducing the width of surrounding footpaths. Installation of three new raingarden tree pits to capture stormwater runoff from Macarthur Street. Installation of two soaker pits to capture runoff and direct it to four new trees. Removing and replacing declining trees and planting additional trees. What benefits has the Burston Reserve redesign provided? Increased canopy cover in the reserve, helping to reduce urban heating. Increased the amount of green open space in the reserve. Provided a sustainable source of water to keep the trees healthy. Reduced the use of drinking water for park irrigation. These pits capture water runoff from the road, irrigating the tree, cleaning the water and reducing stormwater runoff volumes. Each pit is located within the footpath directly next to the road. It is filled with structural soil and planted with a single tree. A slotted drainage pipe runs through the centre of the pit, connecting to a drainage hole in the gutter. This allows water to flow from the gutter into the tree roots. The infiltration trench in Burston Reserve captures water from the road to water the trees. 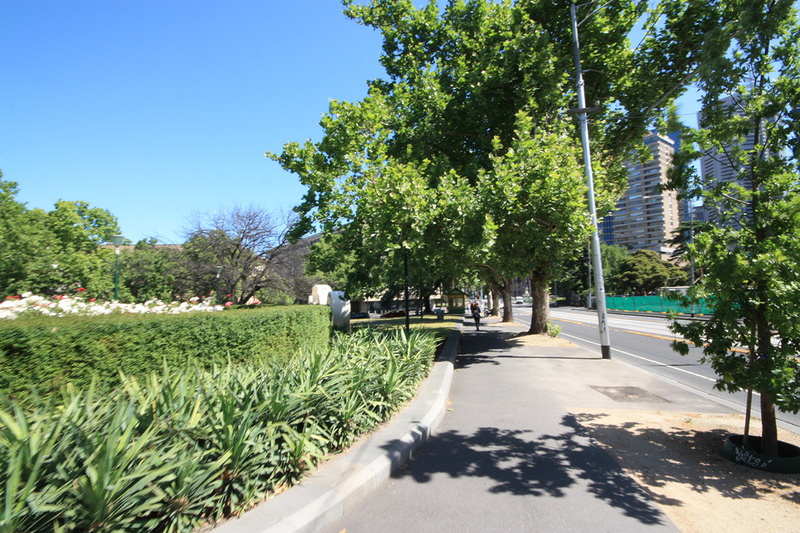 Three raingarden tree pits are set into the kerb along Macarthur Street. They intercept and clean the water before it goes into the drain. 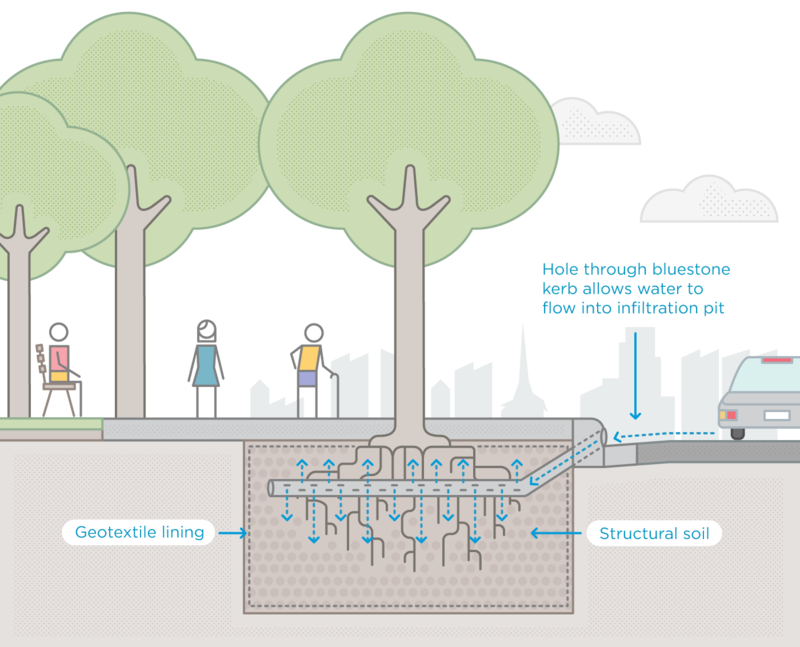 Each pit contains layers of substrate that work with the tree’s root system to filter pollution from the stormwater. This includes nitrogen, phosphorus and oils. The tree pits also include a rock mulch layer to retain moisture in the soil and prevent erosion during rain. A grate sits around the base of the tree, flush with the pavement. This protects the tree pit from damage and ensures that pedestrians don’t trip over it. A pipe is located at the bottom of the well. It allows cleaned stormwater to drain back into the drainage system. Water is diverted from the gutter an into the raingarden tree pit. The total project cost was $300,000. We notified nearby residents and business owners via mail, including drawings of the proposed changes. Feedback was overwhelmingly positive and the project proceeded with minimal changes to the original design. We needed to protect the trees in good health from damage during construction. The tree root systems and existing underground services limited the location, depth and extent of the infiltration trenches. Burston Reserve is a triangular shape, and we were hoping to capture water from all three sides. 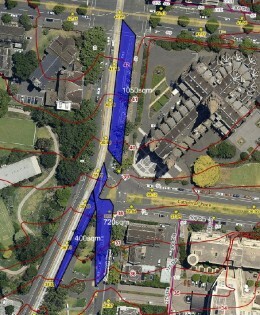 After examining the site contours and surrounding sub-catchments, we established that it would only be possible to capture water from the Macarthur Street side. This diagram shows three separate catchments relating to Burston Reserve. Burston Reserve sits on a slope, so that one end of the park is significantly lower than the other. Unfortunately, the dramatic change in the irrigation regime has resulted in the loss of a large chestnut oak in the lowest section. The soil around the tree’s base became waterlogged and allowed disease to spread to the tree. This could have been prevented if a drainage pipe was installed at the low point in the park. MUSIC modelling was carried out to determine the size and type of water sensitive urban design elements that would be suitable. Two infiltration trenches were built along the southern end of Macarthur Street, beneath the footpath. They are located 2.5 m from each tree to avoid damaging the existing root systems and to encourage growth beyond the drip-irrigation line. Water runoff is directed into the trenches, providing water for the tree root system. Purpose: retains water, is suitable for tree growth and can withstand loads while maintaining structural integrity. Dimensions: each trench is 600 mm deep, two metres wide and three metres long. Composition: fine, clean washed gravel (2.5 mm particles). Purpose: The infiltration trenches are lined with geotextile to encourage tree roots to grow within the trench and to contain the structural soil. 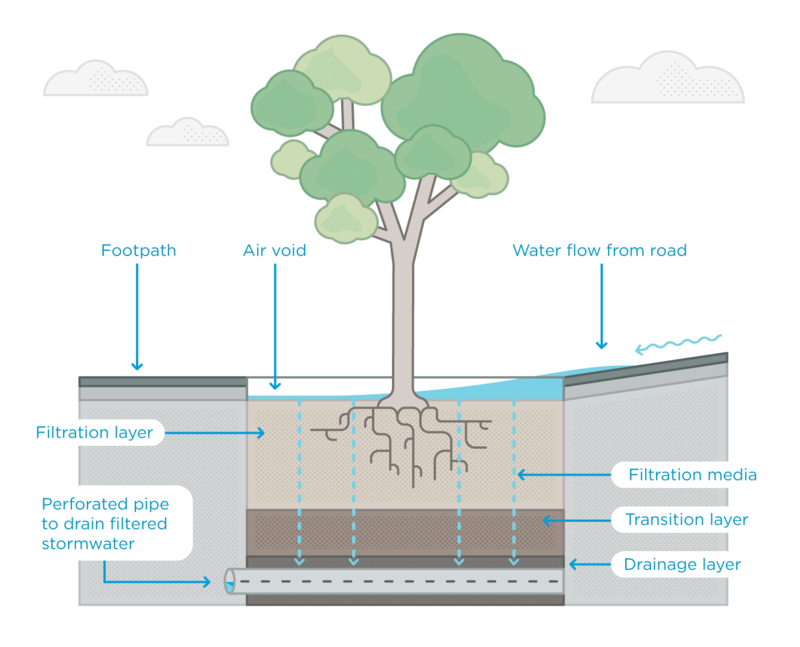 Raingarden tree pits contain three layers of drainage substrate; a filtration layer, a transition layer and a drainage layer. Purpose: this is where all the work happens. The filter layer filters sediments and larger litter. Phosphorous is absorbed into the filter layer with the sediments. Nitrogen is removed via the plant roots and soil bacteria that exist in the filter media. Depth: minimum 450 mm. Depth will vary to suit the depth of the stormwater drain. Composition: 80% loamy sand, 10% vermiculite and 10% perlite, by volume, evenly mixed. A small amount of compost is added to the top 10 cm. The top of the substrate is positioned a minimum of 50 mm below the invert point in the kerb. This air void allows stormwater to pond on top of the substrate before filtering down through the layers, providing additional treatment within a confined space. The four raingarden tree pits along the Macarthur Street edge of Burston Reserve are planted with chestnut-leaved oaks, or Quercus castaneifolia. We chose tree species that work towards our species diversity and resilience targets. A slotted PVC or Ag pipe sits in the drainage layer at the bottom of the tree pit, connected to the stormwater drain. This allows filtered stormwater to flow on to the waterways and prevents water logging at the roots. The high flow bypass is needed to make sure that heavy rain flows are safely conveyed to the conventional drainage network. Typically this is provided by side entry pits located downstream of inlets to the raingarden tree pits.